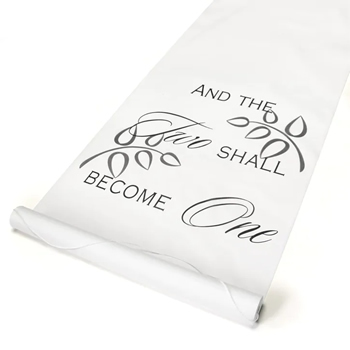 White fabric aisle runner features "And The Two Shall Become One" design in black. Leaves are printed in grey. 36" x 100' long, with pull cord. Design is printed 8' from the beginning of the runner. Wording faces people as they walk down the aisle.